Business is booming at Kobosko’s Crossing. The Wellington shopping plaza is just over 10 years old, and, thanks to a recently renewed leasing push, is almost full with only one space still available. The former farm stand turned local business hub sits on the south side of Forest Hill Boulevard between State Road 7 and Lyons Road. Recent additions include fitness studio CycleBar, SmizePro MedSpa and Re/Max. The Fired Station, a paint-your-own pottery studio, opened Aug. 1. And coming in October: Born2Dress, a locally owned boutique retailer. The last open spot, a 3,500-square-foot furnished office space, already has seen interest, he said. He credits that interest to the plaza’s location and Wellington’s “extremely low” office vacancy rate. 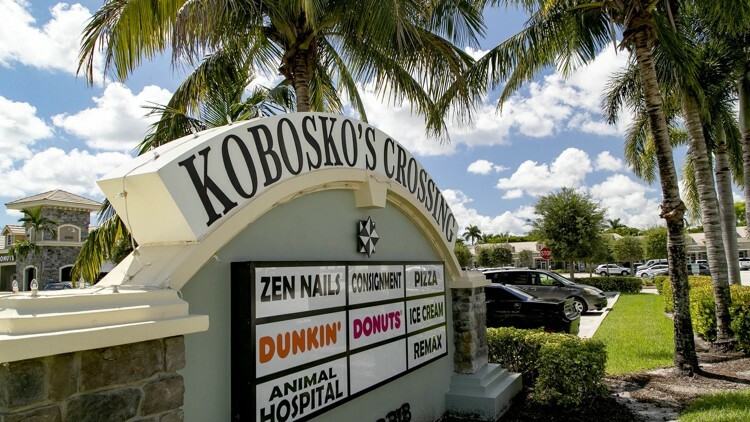 Kobosko’s Crossing is home to shops and restaurants including Dunkin Donuts, Basilico’s Italian Restaurant, Red Balloon Consignment, New Thai Cuisine and one of the original occupants, Kobosko’s Kreamery ice cream shop. Nicole Fuller, owner of the Fired Station, said she chose Kobosko’s for her studio because she was familiar with the area after her family moved to Olympia when she was in high school. “I kind of grew up in that plaza,” she said. The plaza also offers a central location with which many in the area are familiar, she said. “It’s close to the mall, and everyone knows the intersection of Forest Hill and 441,” she added. The restaurants provide for foot traffic that, since her store opened Aug. 1, have brought curious shoppers to Fuller’s door. Many are Olympia residents, such as her parents, who have watched eagerly since Fuller painted “Coming Soon” on her studio’s front windows. “They come in with their ice cream and say, ‘We’ve been waiting for you,’” she said, laughing. The recent changes have made the plaza more female-friendly, said Born2Dress owner Sophia Bornschein. After about a year of serving clients from a storefront on Pierson Road, Bornschein is taking more of a retail approach to her appointment-only boutique. She chose the spot in Kobosko’s because she has “shopped there forever.” She will take over the space soon to be vacated by the Avon store. “I try to make it fun … and make it an experience,” Bornschein said. “That’s kind of what makes this new location so exciting: I get to try something new.